“Death Dinner” — the Dinner That Killed! On the evening of July 6, 1927, Glendale inventor John H. Carson settled down to a dinner of stew and strawberry preserves with his wife and business colleagues. Around 10 that evening, he complained of severe pain, became faint, and began to perspire profusely. He eventually slipped into a coma and died on July 11. Initially, the cause of death was ruled as heart disease, but Carson’s widow insisted that he’d been in excellent health before sampling her cooking. The circumstances were indeed strange, and Mrs. Carson was insistent enough that an autopsy was performed. Today, Dr. A.F. Wagner, county autopsy surgeon announced that a quantity of arsenic had been found in Carson’s viscera. An inquest was ordered, with Mrs. Carson and J.E. Walker, Carson’s business partner appearing as key witnesses. And of course, the Times gave the whole thing a clever name, just in case the story had legs. At the inquest on July 26, Mrs. Carson testified that J.E. Walker, her husband’s business partner, had given her a box of candy and a bunch of bananas, which she’d feared to be poisoned. Walker was outraged at the suggestion, saying that since he stood to make 50% off of the oil pump Carson had been developing, it was certainly in his best interests for Carson to remain alive. Then, a bit cruelly, he added that he’d given Mrs. Carson a reducing recipe along with the candy because he thought she was "too fat." Then again, the woman had all but called him a murderer, so I guess he was entitled to a little snippiness. Walker was also asked whether he’d hoped to get Carson out of the way so he could marry his widow. Walker icily declared that he already had a wife, and had no desire to marry Mrs. Carson. Oddly, Carson said that she’d wrapped up the candy and bananas, given them back to Walker, and told him to burn the parcel in his incinerator without telling him what it contained. When asked why she’d done this, Carson said that she hadn’t wanted the parcel littering up her kitchen. 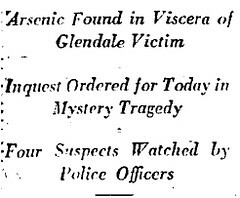 Though there was certainly something fishy about this case, investigators were unable to piece together enough evidence to prove a murder had taken place, and the inquest was closed on July 29, 1927, less than a week after it was opened. In fact, just about the only thing that was established was that Carson had most likely NOT committed suicide or consumed the arsenic accidentally by drinking from an irrigation ditch near an oil well. Just how 40 grains of arsenic got into his belly remains a mystery.